The Regional Performance Centre provides a skill-based programme which is aimed entirely at individual player improvement. Sessions take place on eight Sundays from October to May. No National or Regional League games are permitted on these dates. 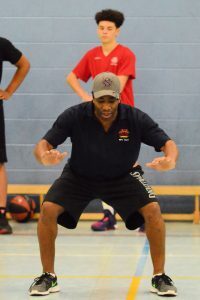 The typical day includes two basketball sessions on court, with Education sessions aimed at increasing players’ awareness of all factors which influence performance, and input on Strength & Conditioning. Each of the eight days focuses on one specific area of basketball skill. The sessions take place at a variety of different venues in the region to help spread the travelling load. Most often, a double court venue is used, with the girls’ and boys’ groups working alongside each other. 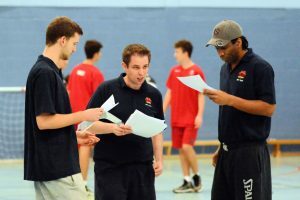 Each of the groups has a Head Coach appointed by Basketball England and a team of other coaches to ensure attention to individuals and small groups. The first session on court each month is prescribed by BE and the same content is delivered at all the Regional Performance Centres throughout the country. Club nominations at any time during the season, which will usually require attendance at one session initially for assessment. 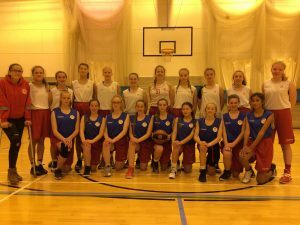 The Regional Performance Centre is a two year programme up to Under 15. Players identified from the Under 13 group as above will be invited back for a second year if their progress and performance indicates that they have taken full advantage of the opportunities offered.